Travel serves a distinct purpose in these poems, nudging us to observe the familiarity of ourselves and beloved others against the backdrop of unfamiliar scenery. An impression bubbles up of Dunn sitting at pavement cafés, on trains, in airport terminals, always with a notebook in hand as he scratches down his thoughts. Meet the sleep-starved man quite beside himself, the one ensnared in jealousy of two calling owls, the poet fearing encounters with an angry mob, and saving desert dust in the corner of his eye. As beautifully as they arrange themselves on the page, the true power of Dunn’s poems is only revealed by reading them aloud, preferably in the hearing of other people, so that their rhythm uncoils on your tongue and resonates in the air between you. I promise you, there will be lines that feel like evocations of moments you’ve lived yourself, and moments you’ll wish that you’ve lived. There’s no mistaking the suggestive intimacy of the collection’s title. These are poems to breathe in at your leisure, and learn a little something from too, as Dunn entreats us to pay more attention to our surroundings; to noticed the small wonders occurring in the corners we forget to dust and to unearth the nostalgia rooted in our muddied past. 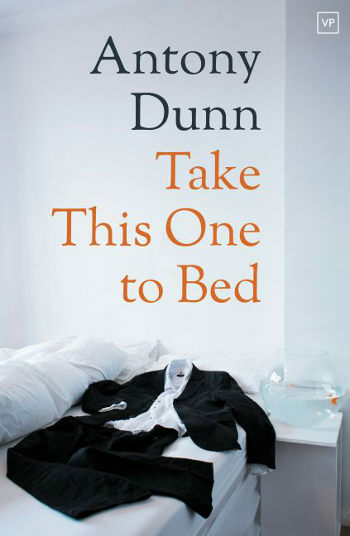 Take This One To Bed by Antony Dunn is published by Valley Press and available to buy from Amazon. This entry was posted in Reviews and tagged Antony Dunn, poetry, Take This One To Bed, Valley Press by Judy. Bookmark the permalink.